Additional information: Jeff Wilson, Bob Dunn, Russell Wear and John Smailes. The "Magnesite" plant at Harrington was set up during WWII by the Ministry of Aircraft Production to produce magnesia from seawater, by reacting it with calcined dolomite. The magnesia paste produced was calcined in rotary furnaces and turned into magnesium oxide powder before being sent away to the Magnesium Elektron Company in Manchester, for use in vital aircraft components, flares and incendiary bombs. Prior to 1936, Britain had been dependent on imported magnesite from Austria and Greece, and some means of home-production had to be arrived at. The Steetley Lime and Basic Company opened a plant in Hartlepool in 1937 that became known as the Palliser Works. A subsidiary organisation, the British Periclase Company, formed in August 1937, and erected a full-scale plant producing 10,000 tons of magnesia per annum. It was realised in 1939 that supplies of magnesia would need to increase to feed the ever-burgeoning war-effort, and a secret project saw the Steetley Company begin to construct the Magnesite plant at Harrington, on the site of the former Harrington Ironworks. Work started on the 3rd July 1940 and it was officially opened on the 27th October 1941. 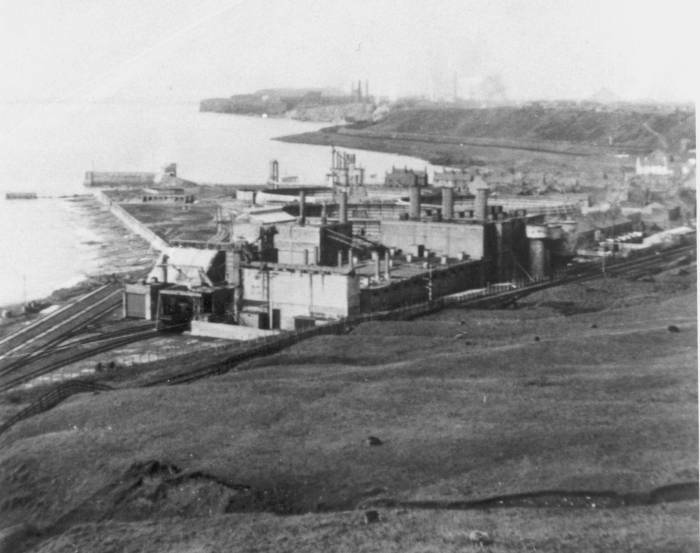 The British Periclase Company operated the site on behalf of the Ministry of Aircraft Production, and in some Government circles it was referred to as the 'Ocean Salts' works, mirroring a similar operation in Barry, South wales. 'Magnesite' was a "hush-hush" project at the time, and the new rail-head was referred to throughout the railway system as "Harrington Ironworks" in a bid to fool the enemy. The output of this vital West Cumberland war-effort establishment was 40,000 tons per annum. Calcined dolomite was trained into the Harrington Shore works daily from Coxhoe, in County Durham, as were wagon-loads of coal, which was pulverised and used to fire the mixture. Occasionally, train-loads of lime were brought into the plant from Flusco, near Penrith. The resulting magnesium oxide powder was put into eleven-ton wagons consisting of two vertical, slightly conical tankers, and ran up to Workington Main station, where it was picked up in the evening and delivered to Clifton Junction, near Manchester, thence to the Magnesium Elektron plant. The vital extraction and conversion process caused a thick white dust to settle on everything downwind of the works, which meant homes, gardens and streets in Harrington! The Magnesite works was 'mothballed' in 1945 and eventually closed in 1953, following a brief revival during the Korean war. It was reckoned on closure that magnesium produced at Harrington cost 4/3d per pound (21p), but cost only 1/7d (9p) elsewhere. The site was gradually dismantled and "developed" into Harrington marina. The adjacent communities formed by Christian Street, Nook Street, Stanley Street, Henry Street, Curwen Street and William Street were demolished also. 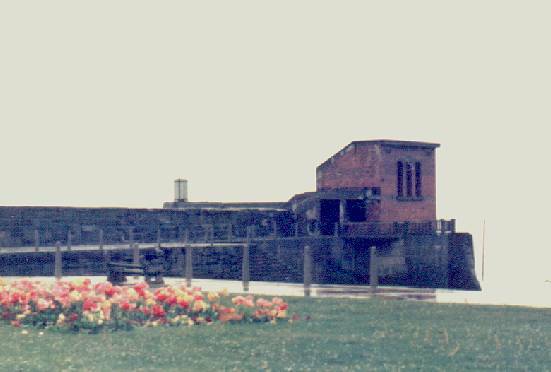 The remaining visible evidence - the modified harbour, which had a concrete 'blockship' sunk in the entrance to turn it into a reservoir and the pumping station (pictured above) - have now been eradicated. The pump-house stood for many years half-way around the pier, and its sloping seaward roof was a favourite for sunbathers and graffiti "artists". It was always locked shut behind iron doors (as I remember) with the circular profile of a large pipe to the left of the doors. Those readers of an 'anoraky' disposition might be interested to learn that there was an intact 'J'-bracket with a couple of No16 pitch-manufactured telephone insulators mid-way up on the south-eastern corner. It may still be possible, at low tide, to climb inside the pump inlet-pipe which is at the end of the pier. The following photographs were taken from fixed locations to record progress of the construction, and were kindly provided by Robert Dunn. Clicking on them will open a larger image. THE VIEW FROM COPPERAS HILL, LOOKING NORTH. THE SLAKER UNIT AND SETTLING TANKS 'A' AND 'B'. Shown below is a magnificent photograph of the Magnesite works, kindly sent to me by Malcolm Huddart, an ex-Harringtonian. Close inspection reveals the St. helens colliery "pyramid" in the background. The pump-house can be seen on the elbow of the nearly right-angled pier. Foreground left is a small engine shed for the Harrington Shore Works (as it was referred to) donkey-engine. Compare this image with the map section and left-hand sketch shown below. 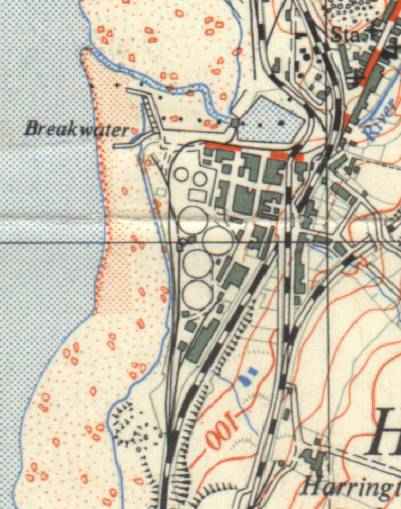 The settling tanks, slaker infrastructure and rail sidings can be clearly identified on this 50 - year old map. The site has now changed beyond all recognition. The linkable images (below) are to a couple of fine sketches of the "Magnesite" plant by the artist Henry Rushbury, R.A., who toured the Steetley works to produce a company book. They were sent to me by John Smailes. These beautiful sketches represent - to my mind - industrial art at its finest, and conjure up an evocativeness commensurate with any natural landscape scene. He has certainly captured the gunmetal Cumberland skies well enough! Further details of the magnesia works at Hartlepool can be found here.